Many of our Whole-In-One Adjustable Club customers also purchase telescopic drivers and putters as a "3-Club Set" so they can bomb it off the tee, use the Adjustable for all their irons, and have a conventional-feeling putter. Quite a few others purchase additional telescopic clubs such as hybrids and wedges. But no one has purchased as many as Richard Wadwell who now has 10 of our telescopic clubs. 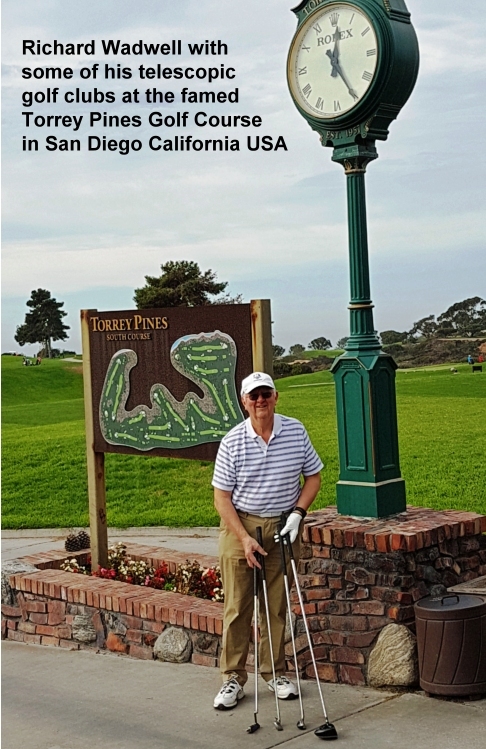 We asked him to share his thoughts about our clubs, and he went beyond the call of duty by including several pictures and a list of many of the golf courses around the world where he has taken his telescopic clubs. If you are considering getting one or more telescopic clubs, this page will help answer some of the questions you might have. Thank you for the opportunity to share some feedback about how much I like your telescopic clubs. I purchased my first club from you in 2008 with a considerable amount of hesitation. I couldn’t believe the claims that the adjustable loft club was solid, especially with a telescopic shaft, but decided I would test it because of your satisfaction guarantee. Well, it didn’t take long before I knew for myself that your clubs are great. As you know, I have since purchased a total of 10 telescopic clubs from you, including some custom builds using heads I sent to you. These include Callaway, Toski, TaylorMade, and Cobra heads. While I was impressed initially with the solid feel and great shots, I admit that I had my doubts about their longevity. I thought they might get loose, or eventually wear out. But it is just the opposite. As you describe on your website, they get even more solid as the surfaces smooth. After several rounds, all my doubts were gone, and now I don’t play with my regular clubs any more, even when I am home. Your telescopic clubs hit just as well as my regular clubs! That still amazes me. I travel quite often, and I always take my telescopic driver, adjustable, and putter in my checked bag. Sometimes I don’t get to play because of weather, but it doesn’t cost me any extra baggage fees to toss them in with my clothes. I imagine I have saved several thousand dollars over the years by not having to pay baggage fees. That’s a pretty good way to get all the money back that I have spent on your clubs…and a whole lot more. As you can see from my list, I have played with your clubs in many parts of the world. I love it when people see me extend my clubs and stick them in my little Sunday Bag. And of course, they are even more impressed at how well they hit the ball. It sure is fun to show off my Divnick telescopic clubs, and especially to let others hit with them! They always shake their head in disbelief at how solid they are. I also want to thank you for your fast and courteous service from that very first order. Your communication is top notch and your speed is impressive, especially considering that some of my clubs have been special orders. After several years of using your clubs on a regular basis, I highly recommend them to anyone wanting the portability that telescopic clubs provide. It has been my pleasure to brag about you to all my golfing friends and those I meet while playing this wonderful game. Richard's list of countries and courses where he has taken his telescopic clubs is at the bottom of this page. Our telescopic drivers collapse to 26" long. The putters and Adjustable even shorter. So a 28" or 30" roller duffel bags will easily hold as many telescopic clubs as you want to take. If you web-search "30 inch roller duffel bags" you will find many choices. Walmart has a Coleman model for less than $30. Most of them have a separate zippered bottom compartment that is a great place for your clubs and shoes, with plenty of room for your clothes in the upper portion. This allows you to take your clubs on every trip without having top pay extra for another checked bag, saving $100 or more on EVERY TRIP!!! Another way you can save even more money is by being able to downsize your rental car. A full-size golf travel case won't fit in a small car. But with your telescopic clubs in a 30" roller duffel bag, you can fit them in the smallest cars in the world. We thank Richard for his pictures and testimony. It is our pleasure to help make golfing more affordable, especially while traveling. Marriott Son Antem Golf Resort, Llucmajor, Mallorca. Order ANY 3 or more clubs and get an additional 10% Discount! While the "Whole-In-One Divnick Adjustable Club" can play the whole game, it is most like an iron. As a 4-iron length, it can't generate as much club-head speed as a driver. And it is the most unlike a putter in terms of length, shape, weight, and feel. So most people who get additional telescopic clubs get our "Tee & Fairway" Driver, and a Telescopic-Putter to go with their Adjustable. With these 3 clubs, you can bomb it off the tee and hit long fairway shots with the TF Driver, replicate all your irons and wedges with the Adjustable, and putt with a normal length and feel with a Telescopic Putter...and they all fit into a checked roller bag so you don't have to pay all that money to the airlines to check a full golf bag! Remember, "Our Clubs Fly Free!" If you place your order in April for the Adjustable, TF Driver, and Putter (or any 3 clubs) we will give you an additional 10% discount on the total order. That's in ADDITION to the individual April discounts which are significant. This discount will also apply to a Sunday Bag, and any other additional clubs you order at the same time.